You can have up to seven different water quality options in InfoSewer and have each option as a different scenario using a different specific simulation option for each water quality option. 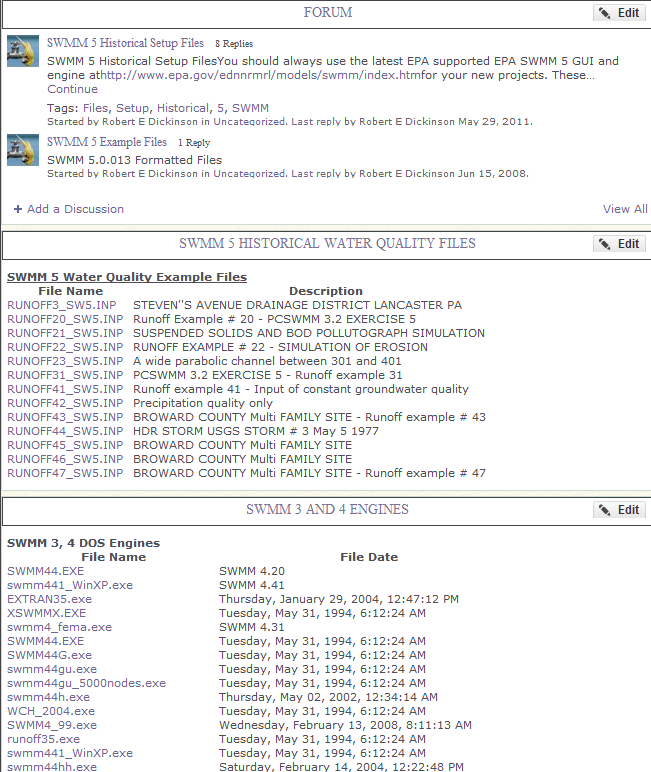 The web site has http://swmm5legacycode.ning.com/ historical SWMM 5 installs, SWMM 5 input file examples and SWMM 4 input files and engines. The SWMM 4 engines go back to SWMM 3.5 engines from the 1980’s. 1. A minimum of 2 iterations per time step with the 1st iteration NOT using the underrelaxtion parameter of 0.5 (Figure 1) 2. If both the downstream and upstream nodes are converged then the link drops out of the iteration process during the time step (Figure 2) 3. The number of iterations for each link can vary over the simulation from 2 to 8 depending on how fast the flow is changing. How is the St Venant Equation Solved for in the Dynamic Wave Solution of SWMM 5?by dickinsonreSubject: How is the St Venant Equation Solved for in the Dynamic Wave Solution of SWMM 5? You can have design storms, monitored storms of any length of the time from minutes to centuries, use intensity, volume or cumulative precipitation, use both rainfall and snowfall in the same rain gage depending on temperature, use both time series or external files for the rain gage and have unlimited rain gages with the limitation of one rain gage per subcatchment . The attached example shows one way how SWMM 5 RTC Rules can be used to have the low flow go down a leaping weir orifice and the high flow go over the weir to the downstream section of the sewer. May 21, 2012 ScienceDaily (May 21, 2012) — A clear change in salinity has been detected in the world's oceans, signalling shifts and an acceleration in the global rainfall and evaporation cycle. In a paper just published in the journal Science, Australian scientists from the Commonwealth Scientific and Industrial Research Organisation (CSIRO) and the Lawrence Livermore National Laboratory, California, reported changing patterns of salinity in the global ocean during the past 50 years, marking a clear fingerprint of climate change. Example Groundwater Model in SWMM 5by dickinsonreSubject: Example Groundwater Model in SWMM 5 The attached model shows three ways in which the groundwater model of the SWMM 5 subcatchments interact with the node depths of the hydraulic network. The hydraulic network interaction can be either: 1.At a fixed water surface elevation, 2.At a time varying water surface elevation based on the inflow and geometry of the node and 3.At a threshold node water surface elevation. Example SWMM 5 Snowmelt Modelby dickinsonreSubject: Example SWMM 5 Snowmelt Model Attached is a simple sample snowmelt model in SWMM 5 that has built in snowfall and temperature in a one subcatcment model with snowmelt. You define the separation of precipitation into snowfall and rainfall by setting a base temperature in the Snow Pack Editor. The precipitation that falls with when the air temperature is below the base temperature is stored in a snow pack where it eventually will melt when the temperature rises or is moved via plowing. You can have an initial snow cover, final snow cover and runoff from the melting snow long after the snowfall occurs. There are six options for runoff routing in SWMM 5: ·All Runoff to an Outlet Node ·All Runoff to another Subcatchment ·All Runoff to the Pervious Area of the Subcatchment or other Subcatchment ·All Runoff to the Impervious Area of the Subcatchment or other Subcatchment ·Partial Runoff to the Pervious Area of the Subcatchment or other Subcatchment ·Partial Runoff to the Impervious Area of the Subcatchment or other Subcatchment The attached example SWMM 5.0.022 file has three catchments in a chain, the 1stSubcatchment Routes to the Pervious area of the 2nd Subcatchment and the 2ndSubcatchment routes the runoff to the Impervious area of the 3rd Subcatchment which routes all runoff to an outlet node.